Note: Below is my column as it appeared in the March 28, 2012 edition of the Barrow Journal. Scroll down to find some other helpful links and ways that I’ve tried to teach math. When I was a young girl, I was gently reprimanded for using my fingers to do math. I had to do it in my head. Throughout school, I never liked math, and I never did well in it. I sat in the back of the room during high school geometry, and I barely listened to the teacher. For algebra, the teacher was my high school’s football coach, and I remember him bellowing out instructions like he was on the football field. In college I majored in English, and one of my professors said, “English majors are notorious for hating math.” I was only required to take one math class in college, and I waited until my senior year to take it. The teacher was excellent, and my study skills had improved remarkably by that year. I got an A in the class. Even now, math is not my forte. If I have to figure out how much to tip someone, it will take me much longer than most people. But just because it takes me longer to figure out simple math, doesn’t mean that I can’t do it. While reading Discover Your Child’s Learning Style, I discovered that I’m a very strong visual learner. Though I knew I was visual, it surprised me at how much this learning style was dominant for me. I started thinking about how I add, and although I don’t count on my fingers anymore, I actually visualize them in my head when I’m adding simple numbers. So, I guess I showed those teachers! I’m not sure how math is taught in school now, but I’m aware that several math curriculums available to homeschoolers use manipulatives for learning addition and subtraction. Using beads or small blocks, a student is allowed to move the pieces around and actually see that two beads plus two beads equal four beads. I don’t ever remember getting to use something like that as a child. I don’t know if you can make someone like math if they aren’t good at it, but as I think about how I want to teach my boys math at home, I know I’m going to do everything I can so that it’s engaging. I want to show them how we use math everyday, and if they want to use their fingers, you can bet I’ll let them. My five-year-old is very creative and loves stories, so I purchased the first two books in a series called Life of Fred. They aren’t too expensive, and the books are comprehensive through college-level math. Life of Fred teaches math through a story about a character named Fred. It’s funny and quirky, and my five-year-old loves it, and he even asks to do more. It’s easy to do one chapter in less than an hour, and I like that there are only a few problems to work out at the end of each chapter. The second book has proven to be a little beyond my son’s ability at this time, so I’ve decided to wait awhile before we work through it. In the meantime, I’m doing a few other things to teach him math. At the library, we found the shelf with all the preschool and kindergarten level math books, and I’ve been checking them out and reading them at a leisurely pace. Some of the books are easier for him than others, but he seems to like learning about numbers through story. I try to get him to work out some of the equations, but I help him when needed. He is an auditory and visual learner, so I downloaded some math songs to play on my iPod in the car, and we’ve watched several YouTube videos about math. I also try to teach him math while we’re cooking or baking together. Before I started doing these things, I thought I was losing him because one bad day he told me that math wasn’t fun. After stopping the formal lessons and instead trying the story books and music, he delighted me one day by writing several equations on a piece of paper. 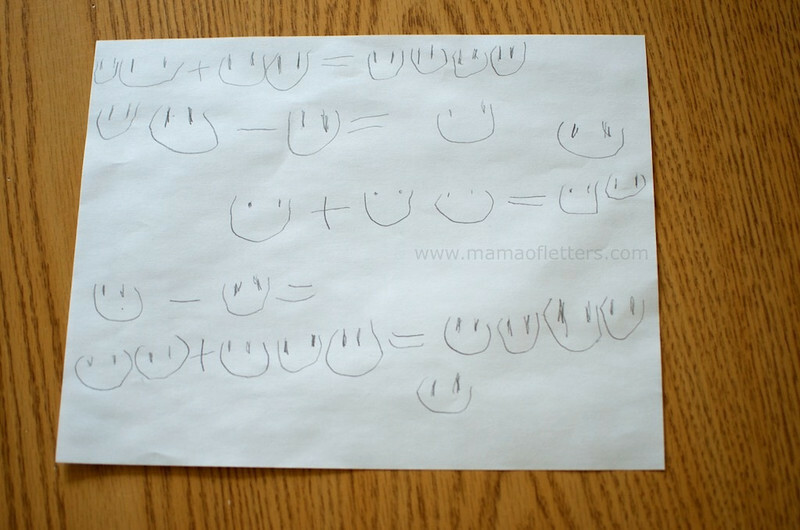 He drew smiley faces: two smiley faces + three smiley faces = five smiley faces. My husband and I were pleasantly surprised and it confirmed my opinion that children learn best when they aren’t forced to learn. Introduce them to ideas, books, educational television, and most importantly, show them how this stuff is used in everyday life. They will catch on and learn it at their own pace. Note: So that was my column as it appeared in the March 28, 2012 edition of the Barrow Journal. Below are some helpful links and other ways I’ve tried to teach math. Last year I purchased an inexpensive poster (less than $3) of the numbers 1-100 at a local teacher’s store. My son really enjoyed looking at it when we first purchased it, and it’s been helpful along the way too. Counting by 5s is a challenge for him at this point, but I’m glad I have the chart to refer to when trying to explain these concepts. My two book by Moncure, Jane Belk. – There’s a series of these books, and while they are preschoolish, there was enough simple math in them to make it worthwhile for my five-year-old, I thought. My five book by Moncure , Jane Belk. Give me half! by Murphy, Stuart J. – Excellent book. My five-year-old loved it. The Hershey’s Kisses subtraction book by Pallotta, Jerry. Measurement by Pistoia, Sara. – After this book, my five-year-old wanted to use the measuring tape to measure things around the house. Math for all seasons : mind-stretching math riddles by Tang, Greg. – Challenging and worthwhile for my five-year-old. There are many other math books, and I hope to make use of many of them! You can find several on Amazon. There are so many that I can’t possibly list them all. If you click on the above, you’ll find many others. We received Inchimals for a Christmas gift, and my five-year-old loves them! Unfortunately we haven’t made using them a habit. I have purchased Eat Your Math Homework, but we haven’t used it yet. However, whenever I cook with my five-year-old, I try to emphasize how we measure and count the ingredients. 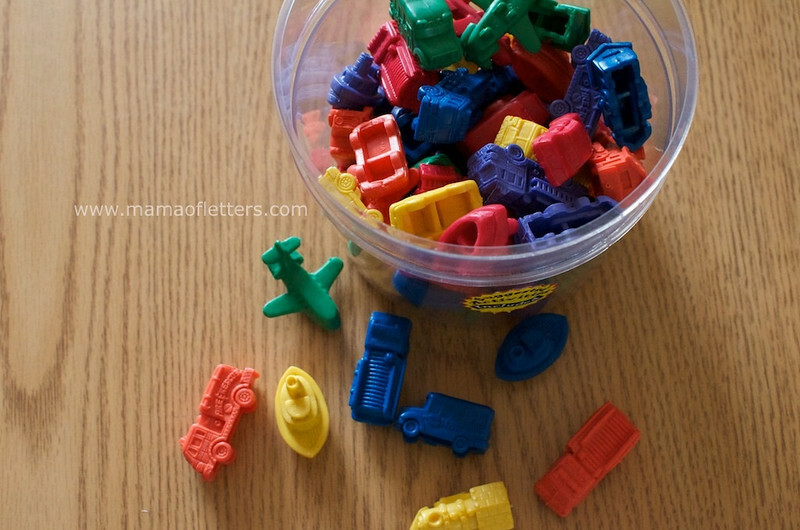 As you can see in the photo, we have a bucket of little vehicles that have been invaluable to me as I teach my son math skills. We have used them while working through the Life of Fred math books, and I even used them the other day when I incorporated math into one of our puppet shows. (More about that in a future post!) These were a gift and also purchased at a local teacher’s supply store. When my son was younger, we used some preschool workbooks, and I’ve also used some inexpensive flash cards, but not very often. We also have several computer programs and apps that teach math, but since there are so many out there, I’m sure you’re already aware of this. I pretty much let my son play with these on his own, though I think they would be more helpful if I sat with him while he was working through the problems. Other than this, I try to catch the teachable moments and make him figure out simple, everyday math in his head. Similar to how I have taught beginning reading, I have used resources that were available to me or inexpensive. I consider it all a work in progress, and as he gets older, I’ll try to find other resources to fill in the gaps. What recommendations do you have for teaching early math skills? This post hit a chord in me very strongly. I also hated math and loved English and reading and that stuff. I went to a very progressive graduate school for education called the Bank Street college. It was in my math for teachers class that I started understanding dividing and multiplying fractions through using the materials my teacher had available to use. Bank Street is a big leader in education and very big proponents of hands on learning.You may want to check out cuisinairre rods, and unifix blocks. They are materials that I remember using with young children and very often they come with great ideas of what to do with kids. I have a friend who recently finished Bank Street as a math specialist and she talks about how sad it is that so many kids hate math when it can be so much fun if it is presented the right way with the right materials. Thank you for your comment, Faigie. I agree – it’s sad that so many kids hate math. I think the HOW to teach it very much depends on the child, and parents really need to figure out the best way their children learn and help them do it that way at home! Hands on would have definitely helped me when I was growing up, and my son and I are really enjoying the Life of Fred books. I’m learning it all over again! And probably more! Amber, Thank you for your comment. I’m glad that suggestion about visual teaching helps you. It’s still something I’m trying to figure out for my children…what works best for them etc. I’ve been meaning for over a year to write about learning styles too. One of these days I’ll get around to it! Let me know how it goes for you!